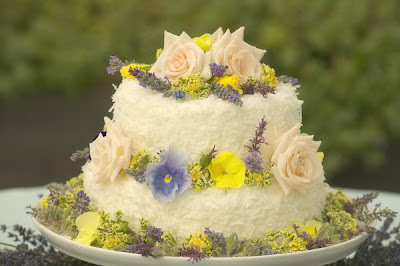 A few decorative edibles from my garden decorating a rich chocolate cake: day lily buds, borage flowers, lavender, roses, bachelor buttons, mint, variegated pineapple mint, and bronze fennel. 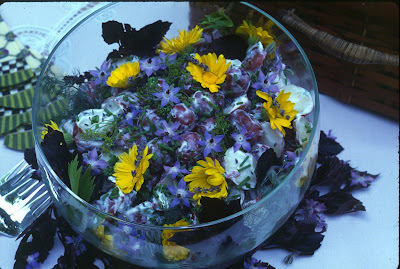 When we say that flowers are edible, that doesn't mean they're all equally tasty. Beautifully perfumed roses taste better than roses with little scent; sweet smelling lavenders taste better than those with a camphorous aroma. And even then, its the petals or buds that are tasty, not the stem, the recptical, or the calyx. People who have allergies shouldn't eat the stamens and the pollen parts. I'm particularly annoyed by pretentious chefs who decorate a plate with small orchids or other flowers straight from a tradtional florist. The grower has sprayed them within an inch of their lives. When they come from your own garden, that of a friend, or a trusted organic source, you have full control over what you put on your table. More flowers & herbs, home-grown, organic, and rinsed before using. 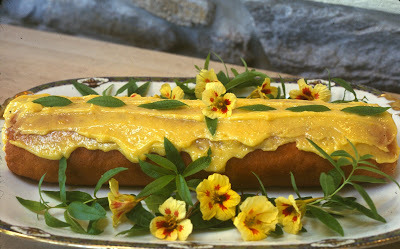 Sponge roll with lemon sauce garnished with nasturtium flowers' Peaches and Cream' and lemon verbena leaves. 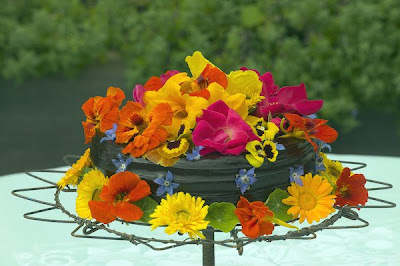 Chocolate cake, chocolate icing, garnished with nasturtium flowers and leaves, day lily flowers, pansies, calendula, roses and borage flowers from my summer garden. Thanks for the warning about comercial flowers...yikes. In the meantime I am adding to my poppyseed cake flowers from my garden. Enjoy the non-July weather up there...we are in DC.